In the event a sample must be moved from one computer to another, multiple components of the sample must be transferred to the destination computer. Sample packing/unpacking provides functionality to simplify this process. This file is created when a processed sample is saved and has extension “.adcisample”. By default it is found in the ADCI data directory specified during installation. It contains - among other things - the status (other object, monocentric chromosome, dicentric chromosome) of all objects found within each image in the sample. This file is required when including the sample in calibration curve generation or dose estimation. This is the only sample component necessary to use ADCI if viewing images in the metaphase image viewer is not required. A component of a processed sample which are necessary to draw the colored outlines around chromosomes seen in the metaphase image viewer. If contour files are not present, images will not appear in the metaphase image viewer. Images which were examined during sample processing. If image files are not present, images will not appear in the metaphase image viewer. Cannot be modified. ID of sample to be packed. Description of the sample as specified when the sample was created. The description can be modified at this time if desired. When the sample is packed, the description saved within the packed sample will consist of the content found in the description text box here. If ADCI cannot locate either of these sample components, the status of the missing component is “missing”, otherwise it is “found”. Click “Specify Folder” to choose a file-system location where the packed sample will be saved. A new directory named “[ID of sample]Pack” will be automatically created within the chosen directory to house the packed sample. Specify whether to include contour files in the packed directory. Consult the “Sample components” heading above for more information on this sample component. Contour files are included by default. If the “Contour files status” is “missing”, this option is disabled and contour files will not be included in the packed sample. Specify whether to include metaphase image files in the packed directory. Consult the “Sample components” heading above for more information on this sample component. Metaphase image files are included by default. If the “Metaphase images status” is “missing”, this option is disabled and metaphase image files will not be included in the packed sample. When the “Start packing” button is clicked, this progress bar will fill as components are copied to the specified directory. The packed sample directory must be moved to the destination computer. This can be accomplished simply by moving the directory using a USB stick or other transfer device. It may be desirable to compress (ie: zip) the packed sample before moving it. 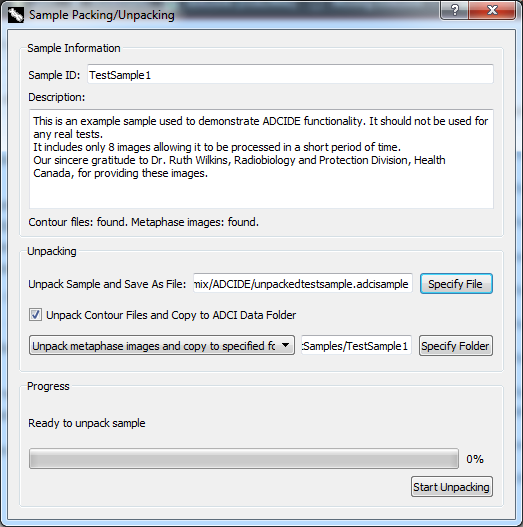 Note if a packed sample is compressed, ADCI cannot automatically uncompress it after it is moved to the destination computer, it must be uncompressed first before unpacking. Cannot be modified. ID of sample to be unpacked. Description of the sample as specified when the sample was packed. The description can be modified at this time if desired. When the sample is unpacked, the description of the sample will consist of the content found in the description text box here. If either of these sample components are not present in the packed sample, the status of the missing component is “missing”, otherwise it is “found”. Click “Specify File” to enter a file name for the unpacked “Saved sample file” component. This file will have the extension “.adcisample” (note: the “.adcisample” extension will be added automatically). Specify whether to unpack the contour files component of the packed sample and copy them to the ADCI Data folder specified when ADCI was installed. Consult the “Sample components” heading above for more information on this sample component. Contour files are unpacked and copied to the data folder by default. If contour files are not present in the packed sample, this checkbox is disabled. Default selection. This option is disabled if metaphase images are not present in the packed sample. Click “Specify Folder” to choose a folder within which metaphase images found in the packed sample will be copied. Please note a new folder will not be created within the chosen folder, images will simply be copied to the chosen folder. This means it may be desirable to create a new folder to house the images before the sample is unpacked. 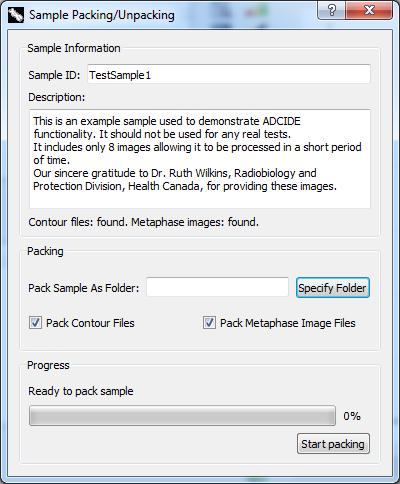 If metaphase images corresponding to the packed sample already exist on the destination computer, it is not necessary to copy the metaphase images within the packed sample to a destination folder. Use this option to specify the directory containing the preexisting metaphase images. This option will ignore the metaphase images which may be part of the packed sample. Note if the option is selected, it will not be possible to view images in the metaphase image viewer. When the “Start Unpacking” button is clicked, this progress bar will fill as components are unpacked.